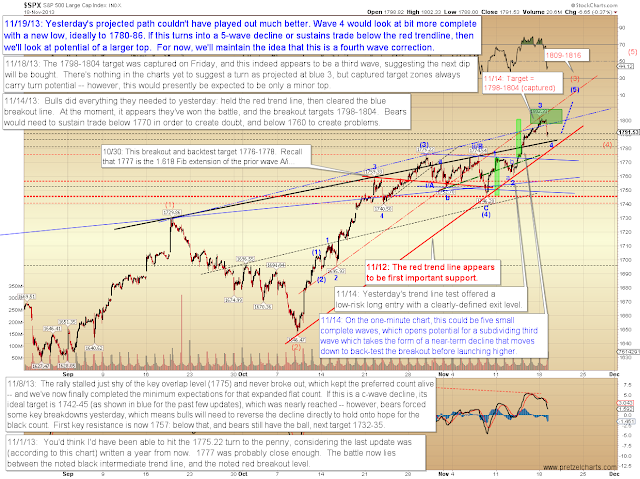 Pretzel Logic's Market Charts and Analysis: SPX Tracking Projection -- and Some Random Thoughts on "Work and Trading"
SPX Tracking Projection -- and Some Random Thoughts on "Work and Trading"
We all know there are more important things in life than work. No matter what that work is: whether it's trading, consulting, or construction. We know this so well, that it's become "accepted wisdom" and a bit cliche. Yet what is work, really? That seems to depend on the individual: for some, work is simply a path toward financial goals, nothing more. For those folks, work is the pure exchange of time and effort for money; it's a means to other freedoms by way of voluntary enslavement. For others (the lucky ones), work is an extension of who they are -- it's a vital aspect of their personalities, which finds expression in a form that also happens to earn money. So, are there more important things in life than work? One of the things my father told me when I was young, which has stuck with me forever: "Life is about people. People are the only thing that truly matters in this world." And I think we all instinctively know that, which is why we judge those who work "too much" (at the expense of their relationships) as doing "something wrong." But I don't think there's a right answer, because it's a deeply personal thing and it depends on the individual. For some people, the answer is probably no, there aren't more important things than work. Still -- I suspect there's a balance to be found, though I myself sometimes struggle to find it. I can't speak for everyone, but I know that personally, I have parts of myself that are so intrinsic to who I am that I simply cannot ignore them without some degree of internal loss. If I do ignore those intrinsic parts of myself, then my personal relationships also begin to suffer -- not necessarily for lack of time, but for lack of having something of value to offer to others. If my own tank is drained because I haven't refilled on the things which nurture me, then I find my ability to benefit others comes up wanting. So I believe it's important to nurture those parts of ourselves which allow us to stand a bit taller, to express ourselves a bit more openly, and, ultimately, to give a bit more of ourselves to the rest of the world. Each individual finds that in different things -- since you're reading this, then maybe you find that in trading. Or maybe trading is a developing aspect of yourself, and you're still working at another job in the meantime. Or you're an investor, and trading is simply another means to an end -- a way to reach goals which have more value to you. Whatever the case, strive to find the balance. Money means a lot in this world: security, health, freedom, etc.. But sometimes in working towards a goal, we lose the forest for the trees -- and we start to obsess over a financial outcome so much that we forget why we were striving for that outcome in the first place. We can cling to something so tightly that we've already lost it. And that type of striving is often laced with emotion -- which makes us less effective traders, not better. Yesterday's market performed about as well as I could have hoped, projection-wise. 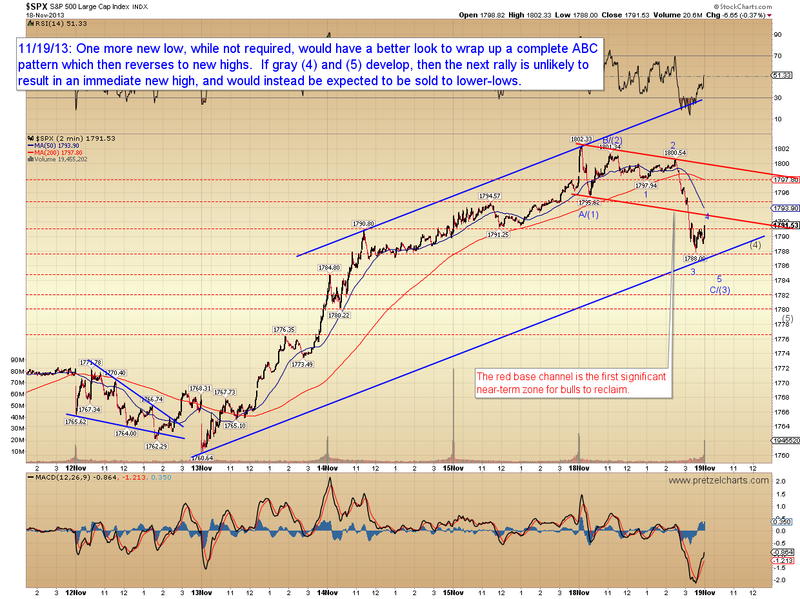 It never ceases to amaze me how well Elliott Wave can work at times. 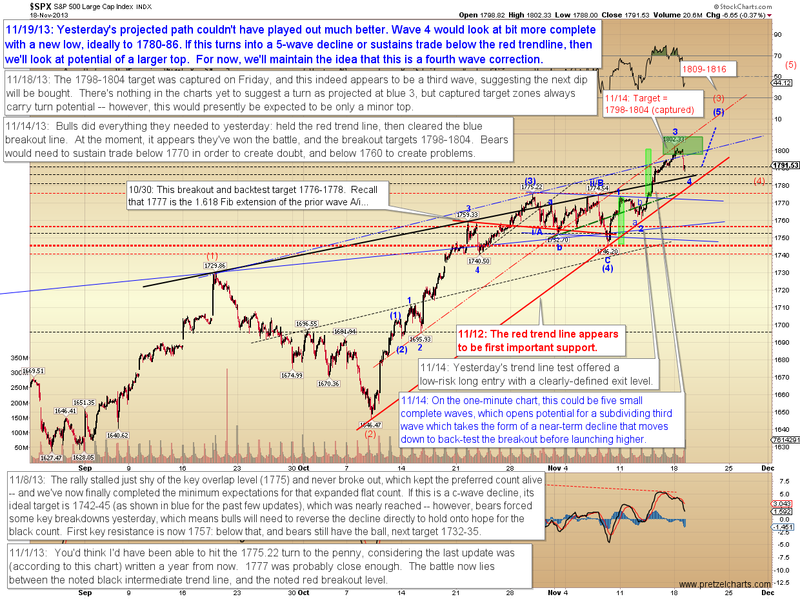 There was really nothing in the near-term chart to suggest a turn, yet the market found resistance right within the target zone -- and at the upper edge of what appeared to be a completing wave structure (as drawn on the 30-minute chart) -- and then reversed. For the moment, we'll maintain the assumption that this is a fourth wave correction. 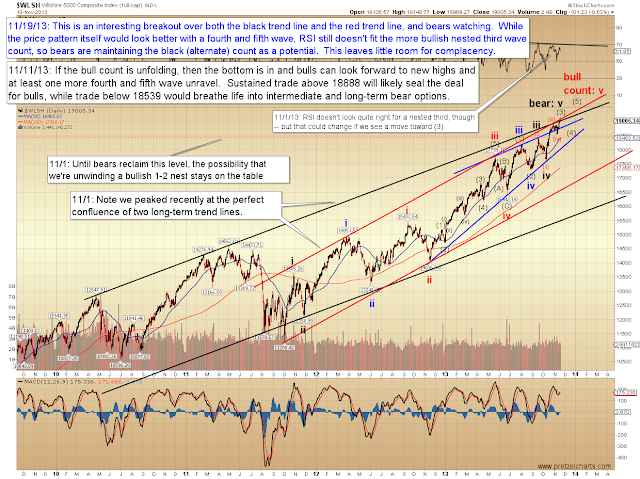 If the S&P 500 (SPX) turns into a five-wave decline, then we'll start looking for additional downside action. 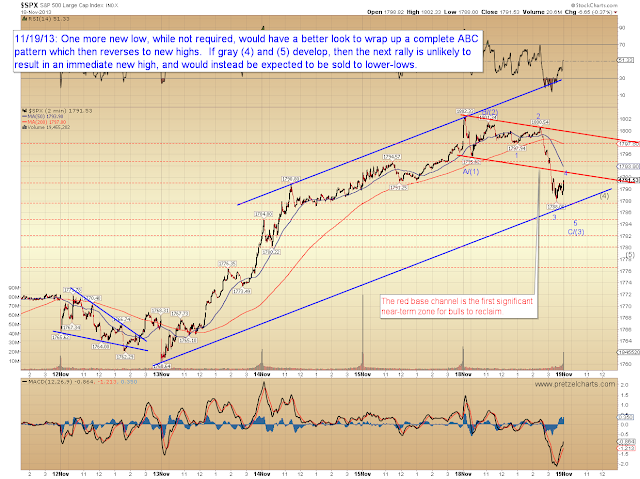 Currently, the decline would look a bit better with a new low, but it's not required. In the event that gray (4) and (5) end up developing, then we'll have to start thinking larger correction. I've also updated the Wilshire 5000 (WLSH) chart, since there's been a noteworthy breakout here. These types of breakouts can sometimes represent the "rubber band" stretching a bit too far, and lead to a snap-back in the opposite direction -- so I wouldn't recommend an attitude of bullish complacency. 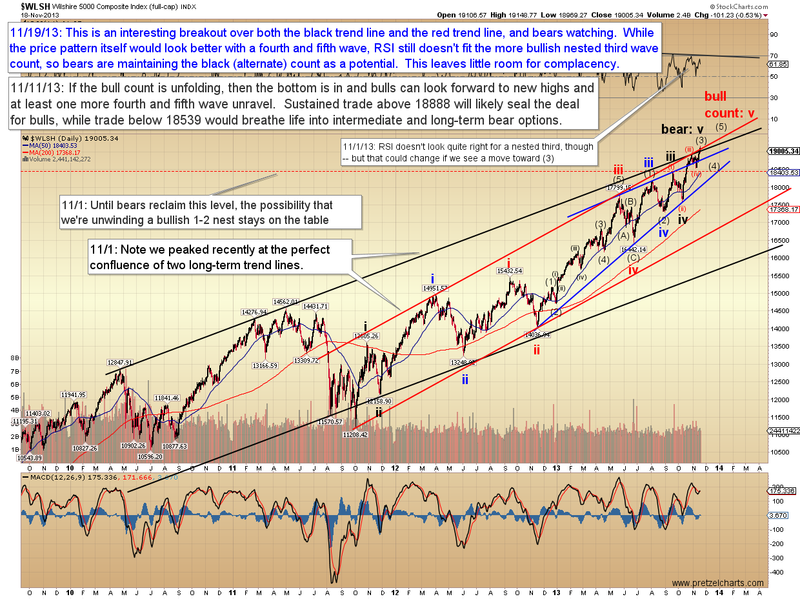 In conclusion, the near-term wave structure would look more complete with a new low. Assuming that doesn't go on to develop into a five wave form, then we'll look for a resumption of the rally soon thereafter. If it does turn into a five wave form, then we'll have to consider a shift of footing. Trade safe.